My family follows the moon. This is because my son practically emerged from the womb obsessed with its ever-changing phases. He didn't begin to speak until he was 6 years old, except for 3 sounds that he would grunt repetitively while pointing his tiny hand at whatever they represented, "Mah" for Mom (Thank goodness I made the cut! ), "Bah" for Ball, and "Moo" for Moon. As his language slowly developed over time, it became lopsided due to this particular obsession, so we were talking about the Waxing Gibbous long before he even knew how to say a proper "Hello". So- my growing interest in astrology has been a total delight for him, and we've been having such a blast learning this stuff together. 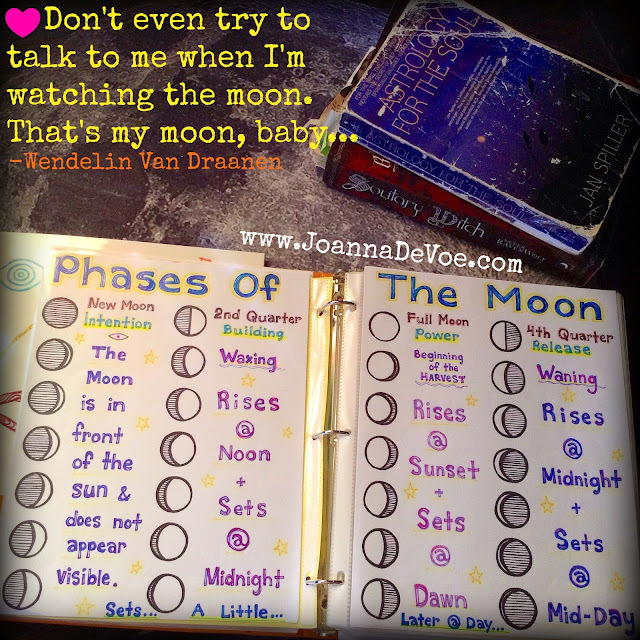 That was the year I really got into following the phases of the moon as they pertain to magick. 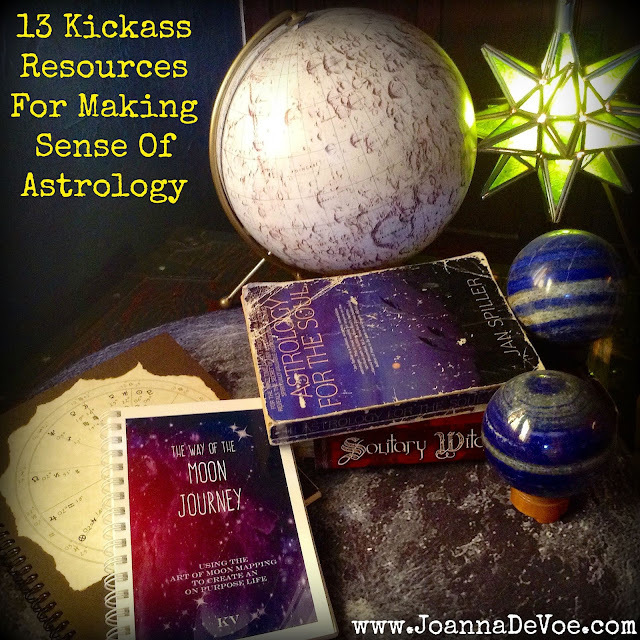 Since then, I've kicked up the astrology fascination quite a few notches, delving much deeper into the various aspects of our natal charts and making so many exciting connections. It really does explain so much! ★ Robert Ohotto's podcast Soul Connexions for archetypal astrology. ★ Jan Spiller's book Astrology For The Soul for understanding the nodes. ★ Anne Ortelee's Weekly Weather Astrology podcast for the weekly forecast. ★ Kelly Simas' Youtube channel for thoughtful insight into current patterns. ★ Kelley Rosano's Youtube channel for current aspects with a side of Law Of Attraction. ★ Astrolabe's FREE birth chart for getting the hang of working with a natal chart. ★ Astrolabe's Professional Natal Chart for deepening your understanding. ★ Aquarius Nation's personalized Birth Chart Book for learning all about YOU. ★ Aquarius Nation's book The Way Of The Moon Journey for learning "moon mapping". ★ Aepril Schaile's Youtube Channel for a blend of astrology, tarot and mythology. ★ Dark Star Astrology for fascinating insights into current trends. ★ Silver Ravenwolf's book Solitary Witch for learning to pair the most basic astrology with magick. Moon Time by Paungger & Poppe or Living by the Moon Ute York are also excellent books!!! I had them for forever then I passed them on when I moved here!! The first book I bought when I got settled was Living by the Moon. It seemed to take me forever to remember the title Moon Time!!! The copies I have now are well worn with use but I wouldn't have it any other way!!! Thank you for sharing this post!!! Don't you must love Anne Ortelee? I keep her current episode downloaded on my mp3. Since the laptop has been in the shop(I have it back now), I'm playing catch up on all the episodes I missed and another podcast HMMMM let me see, what IS the title, oh yeah, it's that AWESOME Witch that puts the "K" back in Magick, The AWESOME, UPLIFTING, INSPIRING, THOUGHT PROVOKING JOANNA DEVOE!!! !